During the mid-19th century, George Catlin created two large collections of paintings featuring Indian portraits, genre scenes, and western landscapes. The first collection, which he called his "Indian Gallery," included more than 500 works completed during the 1830s. Most of the surviving paintings from this group are now at the Smithsonian American Art Museum in Washington, DC. During the 1850s and 1860s, Catlin created a second collection, numbering more than 600 works, which he called his "Cartoon Collection." The surviving works from this collection were acquired by the American Museum of Natural History in New York in 1912. Paul Mellon purchased more than 300 paintings from the Cartoon Collection when they were deaccessioned. In 1965, he gave 351 works from this collection to the National Gallery of Art. When Catlin exhibited the Cartoon Collection in New York in 1871, he published a catalog listing all the works. The catalog entries often included additional information about the subject of each painting. Catlin's catalog entry for this painting follows. DOG DANCE (Sioux).—A singular custom peculiar to the Sioux tribe. For this a dog is killed, and the heart being taken out, it is cut into hanging bits, suspended from a stake. To enter the dance, each dancer makes his boast that in this way he has swallowed a bit of the heart of an enemy killed in battle. No one denying it, he dances up to the stake, and, biting off a piece of the heart and swallowing it, he enters the dance. George Catlin [1796-1872]; by descent to his daughters, Clara Gregory Catlin, Louise Catlin Kinney, and Elizabeth Wing Catlin; purchased 1912 from Elizabeth Wing Catlin by the American Museum of Natural History; sold 1959 through (Kennedy Galleries, New York) to Mr. Paul Mellon, Upperville, VA; gift 1965 to the NGA. Indiens des deux Ameriques, Salle du Jardin Botanique, Brussels, 1870, no. 171. Catlin's Indian Cartoons, Somerville Gallery, New York, 1871, no. 170. Smithsonian Institution, Washington, D.C., 1872. Possibly Centennial Exhibition, Philadelphia, 1876. 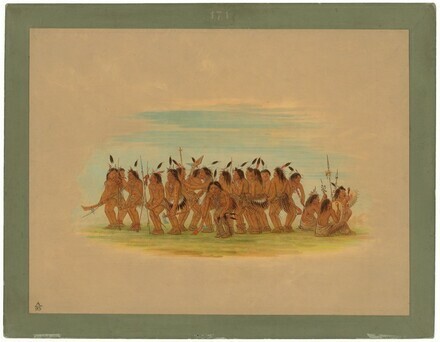 George Catlin, American Indians: Paintings from The Collection of the American Museum of Natural History, Kennedy Galleries, Inc., New York, 1956. Loan for display with permanent collection, Buffalo Bill Historical Center, Cody, Wyoming, 1964-1974. Extended loan for use by Justice Sandra Day O'Connor, The Supreme Court of the United States, Washington, D.C., 1981-1991. American Paintings and Sculpture: An Illustrated Catalogue. National Gallery of Art, Washington, 1970: 31. American Paintings: An Illustrated Catalogue. National Gallery of Art, Washington, 1980: 57, repro. American Paintings: An Illustrated Catalogue. National Gallery of Art, Washington, 1992: 61, repro. Anderson, Nancy. K. George de Forest Brush: The Indian Paintings. Exh. cat. National Gallery of Art, Washington, D.C.; Seattle Art Museum. Washington, D.C., 2008: 9, fig. 3.